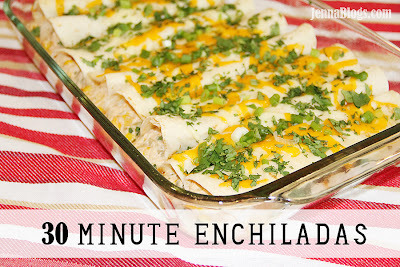 While I LOVE the other chicken enchilada recipe I have posted, I wanted something much faster! I combined some of the things I love about that recipe along with some of the things I love about my creamy baked chicken taquito recipe and combined them into this awesome dish! Preheat oven to 350. Lightly grease a 9*13 pan. In a large bowl cream cheese, sour cream, 1/2 cup salsa, paprika and cayenne until very well combined (no lumps in the cream cheese). Add 1 cup of each cheese, reserving the rest for the top. Add all remaining ingredients except tortillas. Spoon remaining 1/2 cup salsa into the bottom of your greased pan. Stuff and roll tortillas placing them seam side down. Spray lightly with non stick spray to help them brown. Top with remaining cheese. Bake for 18-20 minutes or until cooked through and the cheese is melted. Garnish with additional cilantro and green onions if desired.